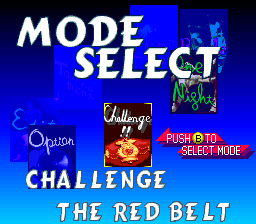 • Made a slight change to SFPW Queen's Special to fix an earlier bug that prevented some labels from appearing in the challenge mode (mainly aesthetics). Haven't heard anything from Pierre lately, so I don't know if the move name adjustment is dead or not. • Finally got a chance to update the page (been busy). I added version 4 of the Queen's Special patch. This is a 100% translation, but I may try to rework the move names some still. I also reworked the id page so that it is now more like a character reference- all the playable wrestlers are identified (we think)!!. Again, thanks to Mike and Pierre of the Manami Toyota Rules club for all of the id work, this patch couldn't have happened without it. • Added finishers to the Queen's Special identification page to help the process along. • Updated the Queen's Special identification page thanks to info provided by Pierre and added patch version 3 (mostly name changes). • Added version 2 of the Queen's Special patch that changes about eight names (Many thanks to Rottrathon for the name corrections and pointing me to a group that may lead to the quick completion of this patch). • Added SFPW Queen's Special section with translation patch. Still need help identifying some of the wrestlers.